It's Showtime, Folks! Why I already love "Better Call Saul" more than I ever liked "Breaking Bad"
When AMC’s Better Call Saul premiered nine weeks ago, it carried with it some of the heaviest expectations in recent TV history. A spin-off of Breaking Bad – one of the all-time great American TV dramas, and which departed recently enough that its impact is still fresh in virtually everyone’s minds – was reason enough to be nervous, given how tricky it is to recapture magic like that the parent show conjured, but a spin-off devoted to Saul Goodman, one of Breaking Bad’s overall thinnest regular characters? And a spin-off that would, no less, be structured as a prequel, one of the absolute trickiest narrative types to successfully pull off? I had faith in Vince Gilligan and Peter Gould and the rest of the Better Call Saul creative team, but like pretty much everyone else looking forward to the show, I naturally approached it with a certain level of hesitancy. Then the premiere aired, with two episodes over two nights, and Better Call Saul effectively waved away most of those concerns in fine fashion. In fact, any and all potential creative pitfalls one could identify going in immediately turned out to be artistic strengths. Gilligan and company had no trouble recapturing the aesthetic chemistry that made Breaking Bad such a joy to watch, and even seemed to be redoubling their efforts to capture Albuquerque in ways beautiful, offbeat, and consistently surprising. The new show felt like a natural extension of the old one, but also immediately established its own quieter, more down-to-earth voice, while always staying in fascinating conversation with the themes and narrative of the parent series. Saul Goodman – who, at this early point in his career, is still going by birth name Jimmy McGill – turned out to be a vastly deeper, much more compelling character than Breaking Bad could ever really hint at, and Bob Odenkirk was more than up to the task of anchoring his own TV drama. 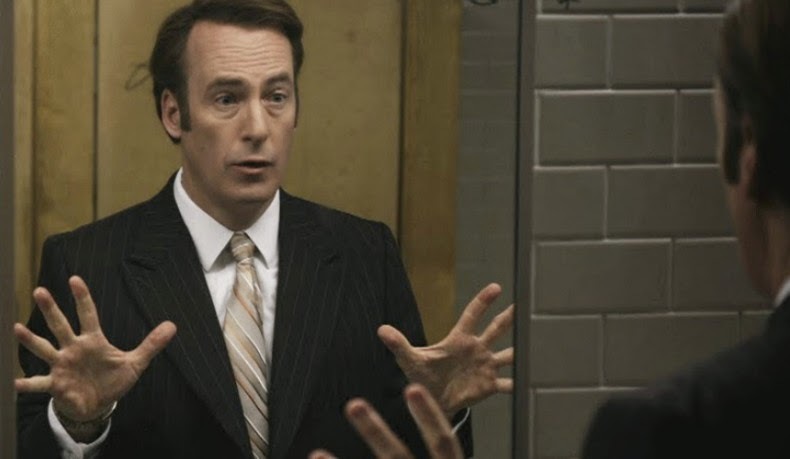 And the prequel structure clearly wasn’t a creative burden, but a fire burning brightly at the heart of the series, our knowledge of where Jimmy McGill’s journey will eventually take him adding countless layers of shading, surprise, and suspense as we examined how this seemingly good man would eventually sell his soul in exchange for cheap suits, piles of money, and a little slice of local celebrity glory. I watched those first two episodes, and I found myself stunned. I wasn’t just impressed by how Better Call Saul was distinguishing itself in the early going – I already actively liked it a great deal, and found myself so fascinated in the imagery, themes, and character work display on those first two episodes that I watched them again shortly thereafter, restless having to wait a week for the next chapter in this story. And when that next chapter came, I found my enjoyment and interest only growing, my thoughts increasingly consumed with analyzing the quiet complexity of the moral play Gilligan and company were expertly weaving. As this process repeated itself with each passing episode, my love for the show invariably growing each and every week, I couldn’t help but start thinking, in the back of my mind, how Better Call Saul was comparing to Breaking Bad – and to my surprise, every time this thought cropped up, I found myself thinking much more favorably upon Better Call Saul. ‘That’s silly,’ I would tell myself. ‘It’s too early to be making comparisons. You’re just thinking that because it’s new.’ And I would squash those thoughts, and go back to watching the show, and thoroughly enjoying it so much that the possibility I genuinely liked Better Call Saul more than I ever enjoyed Breaking Bad would inevitably rise back to the surface of my thoughts. And then, after the ninth and penultimate episode of the first season aired last week, I found myself tweeting this: “All right. I'm calling it. I like Better Call Saul more than Breaking Bad.” I couldn’t help myself. Because frankly, no scene, across all six years of Breaking Bad, ever hit me nearly as hard as Jimmy McGill learning that his brother Chuck, the man he had looked up to all his life and based his entire moral compass upon, had never viewed him with an ounce of the love or respect that Jimmy felt in his heart. That scene devastated me. Knocked me to the ground. Bowled me over and had me tight in its grip – and much as I loved the journey of Breaking Bad, no moment on that show, even in the transcendent final half-season, ever made such a strong impact on me. Last night’s finale, which I felt ended the first season on a simultaneously soft and shattering note – appropriate, I think, for the specific wavelength on which Better Call Saul operates – did nothing to dissuade me from the conclusion I had made. I simply enjoy this series more than Breaking Bad. And looking around the internet, and at conversations I’ve had with different fans over the course of this first season, I don’t think I’m alone in feeling this way. So how is it that Better Call Saul has established its identity in such short order, and to such a strong degree that it has viewers like me are singing its praises so strongly? I think the reasons are at once both simple and complex, obvious and intriguing, and with the first season concluded, I want to dive into all the ways Better Call Saul declared its immense greatness over the course of these 10 initial episodes. So without any further ado, let’s dive into the first season of this remarkably great young series. One of the things that made Breaking Bad striking was its bold sense of grandeur. The show certainly contained various human issues at its core, ranging from emasculation to the nature of family to mankind’s capacity for evil, but from the premise on down, the series liked to push its narrative and themes to fairly extreme spaces. Between Walter White’s sins causing two airliners to collide in mid-air, Gus Fring having half of his face blown off (and still taking the time to straighten his tie), and concluding the series with Walt slaughtering an entire gang of neo-Nazis with a remote-control machine gun, Breaking Bad always had one foot planted outside the door of reality, and gleefully so. 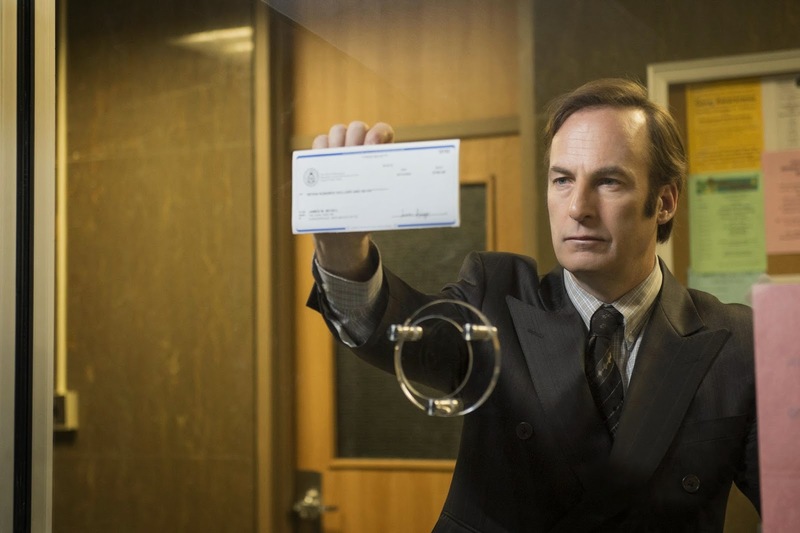 But Better Call Saul, by the very nature of its protagonist, is a smaller-scale show. Jimmy McGill isn’t a frustrated chemistry teacher who decides to cook meth, taps into a vast well of ego and pride, and rapidly asserts himself as the drug kingpin of New Mexico. He’s a small-time hustler who will one day, at the absolute height of his ‘success,’ be a sleazy lawyer serving as consigliere to said drug kingpin. One simply cannot construct a show as high-concept as Breaking Bad around Saul Goodman, and wisely, Vince Gilligan and Peter Gould never once, over the 10 episodes of this first season, tried matching the heightened ambition of the earlier series. Instead, Better Call Saul quickly carved out a niche for itself by reveling in the mundane details of Jimmy McGill’s inherently less-flashy life. Trading in the RV, underground meth labs, and frequent trips to the New Mexico desert with courthouses, parking booths, and retirement homes, Better Call Saul is a show that revels in the mundane and the everyday. At its most flamboyant, a major setting is a home stripped of electricity (which, on a narrative and character level, only serves to increase the monotonous grind of Jimmy’s day-to-day existence, as a major part of his life involves running errands for mentally-unstable brother Chuck). And on the sole occasion the show directly imitated Breaking Bad – taking Jimmy out to the desert in the second episode for a confrontation with one of the parent show’s original villains, Tuco Salamanca – it did so precisely to subvert, question, and play with our existing expectations. The mundane setting mirrored the subject matter. Where Breaking Bad was grand and broad, Better Call Saul was quiet and intimate. It asks some very big questions about the human condition too, but through a much narrower prism, focusing not on extravagant criminal activities, but on the day-to-day struggles Jimmy McGill encounters in his quest to simply be a good and decent man. The series rarely reached for the grand gesture – even the Mike-centric “Five-0,” the most Breaking Bad-esque hour in this initial run, felt quieter, slower, and more introspective than the Breaking Bad equivalent would be – and was instead content to illustrate character and theme through small personal interactions on a decidedly grounded, palpably realistic scale. And here’s the thing: While I always appreciated the bold imagination of Breaking Bad, my personal tastes generally trend more towards the intimate than the majestic. It’s why I’ve always preferred Mad Men to Breaking Bad, Yasujiro Ozu to Akira Kurosawa, and relatively small-scale character pieces like Inherent Vice, Her, and Shame (my #1 films of the year for 2014, 2013, and 2011, respectively) to bigger, more outwardly rousing features. I love it when films and TV shows go for the grand gesture and pull it off, and as evidenced in reviews like this and my commentary on the podcast, there are plenty of maximalist-style narratives I go absolutely gaga for. But in my heart of hearts, I am always pulled strongest towards intimate, small-scale human narratives, because I think quiet and insightful artistic observations about the human condition can be impossibly moving and enlightening. And that, to me, is what Better Call Saul is. Breaking Bad was a modern day Western with a bold voice and a character of mythic proportions at its center. Better Call Saul is a slower, softer contemporary character study, a portrait of an unextraordinary man grappling with basic human reality. Both shows execute at an absurdly high level – and it just so happens that, for me, the content of Better Call Saul resonates much more powerfully. I always felt hints of this human-scale resonance in Breaking Bad, but with Better Call Saul, Gilligan and company have found a vehicle in which to explore this part of their voice fully, and I am so, so happy to have it. Of course, none of this would matter without said ‘unextraordinary’ character at the show’s center – and Jimmy is, indeed, the central factor in the show’s creative success. I call Jimmy ‘unextraordinary’ not to put him down, but, in a sense, to praise him – and to most certainly praise the incredible work Gilligan, Gould, Odenkirk, and everyone involved have done in taking the slimy, soulless Saul Goodman and transforming him into the wounded, emotive heart of this deeply complex and moving show. I think the biggest surprise for me, going into this series, was how much I immediately found myself liking Jimmy McGill. Not in the way I ‘liked’ Saul Goodman on Breaking Bad – enjoying him for the function he played, but not as a human being – or even in the way I ‘like’ characters such as Walter White, Stringer Bell, Tony Soprano, or any other great modern TV anti-hero. I can feel aversion towards these characters as human beings, being disgusted by the moral choices they make, while still ‘liking’ them as characters because they are rich, interesting, and three-dimensional. 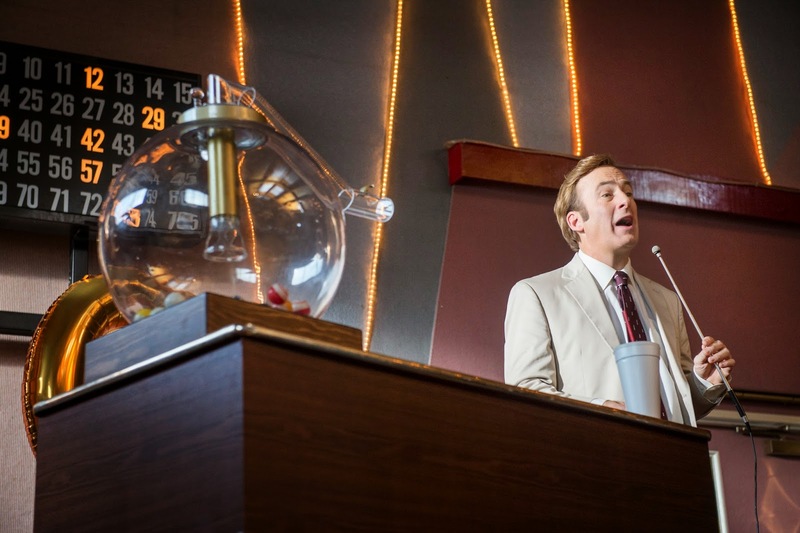 What I love about Jimmy McGill, then, is that he is the rare character, in this intensely cynical age of TV dramas, who can be ‘liked’ on just about every level. I find him just as rich and multi-dimensional as any of those characters listed above, but I also happen to ‘like’ him as a human being, as someone I can easily recognize and empathize with, and whose moral quandaries and personal frustrations aren’t that far from anything any of us experience on a daily basis. When we open the series, Jimmy certainly has some skeletons in his past (and we know he has many more to come in the future), but he is fundamentally a decent, good-hearted guy. His drive to prove himself is obvious, but so is his desire to help others, and to be good to the people he cares about. He cares about no one deeper than older brother Chuck, of course, but he also cares for longtime friend Kim Wexler (Rhea Seehorn, outstanding in a role that asked her to illustrate a complete character in often small amounts of screen time), and for his clients as well. And the most common story type in this first season found Jimmy going to bat for these people with every ounce of ingenuity and willpower he could muster. By the time we’ve witnessed him do many rounds of public defense work, defend his brother from being institutionalized, and solve the case of the crazy Kettlemans(*) for the benefit of Kim – all of which involve making major personal sacrifices – one has no trouble believing that Jimmy would dive headfirst into a dumpster to find documents proving a retirement home is abusing its elderly clients. Jimmy knows the case is a potential windfall for him and his fledgling business, of course, but I also think Gilligan, Gould, and Odenkirk want to make it clear that Jimmy is doing all of this for more than just money. He genuinely cares about this profession, and about the people he works with, and he will absolutely go the distance when it is required of him, even if it forces him to sacrifice his dreams and ambition along the way. (*) Who are, hands down, the best new characters introduced in this first season of Better Call Saul. If you listen to the show’s enlightening “Insider Podcast” – it’s great, and you absolutely should – Gilligan and company talk frequently about how the Kettlemans started the series as little more than narrative functionaries, but were so wonderfully performed by Jeremy Shamos and Julie Ann Emery that the team kept writing more and more material for them, until the Kettlemans became fairly central figures. And God bless them for it, because the strange, inexplicable behavior and chemistry between these two characters was the comic masterstroke of what has frequently been a very funny series. And when, at the end of their arc, both Kettlemans are asked to make a sharp right turn into dramatic territory, both actors pulled it off beautifully. I don’t think it’s *necessary* for the Kettlemans to come back in the future, but if the possibility exists? I would love to see them again. They are some of my favorite characters to come out of either series. And here is where I find Better Call Saul truly masterful: As it became increasingly clear, with each passing week, what a good man Jimmy McGill truly was, the show inevitably became sadder and sadder with each subsequent episode, until hours became truly gut-wrenching for me to sit through. Those who have seen Breaking Bad know Saul Goodman, and they know that, while he was many things, he was most certainly not a good or decent man. I went back and watched the original “Better Call Saul” episode of Breaking Bad midway through the spin-off’s run, and found myself struck by just what a sleaze the Saul Goodman we knew was. He is crass, unsympathetic, and values money above everything else. That spark of humanity that simmers beneath Bob Odenkirk’s eyes in every frame of Better Call Saul did not exist in “Better Call Saul” – and when I realized this, I could not help but feel heartbroken. In Better Call Saul, we aren’t just watching the progression of one man from an unsuccessful but moral lawyer to a successful but immoral lawyer – we are watching nothing less than the slow, painful death of a man’s very soul, tracing the process by which that humanity in Jimmy McGill’s eyes will be forever extinguished. That means that every episode of Better Call Saul, no matter how ‘significant’ the narrative appears in the moment, is positively loaded with emotional significance. On its own, “Bingo” – the season’s 7th episode, and probably my favorite overall – is the story of Jimmy having to put his dreams on hold to do the right thing for the woman he very likely loves, and having to confront the complications that come with having a conscience. In the context of the larger Breaking Bad continuity this series exists in, “Bingo” is an immensely painful study of tragic inevitability, because for all the tortured good Jimmy puts himself through, in the end, he will never see any of those dreams realized. He will never have that high-rise office with the beautiful view; he will never make a good living being a respectable lawyer who helps those in need; and he will ultimately never have Kim in his life, either as a professional associate or a friend. He will lose all of this – and most importantly, he will lose that strong, beating heart that gives the episode its propulsion. He will willingly cut this soul out of himself, and everything that having that soul entails, so that he never has to feel that pain again. And that doesn’t just add color to Jimmy’s story in Better Call Saul – it completely recontextualizes Saul Goodman on Breaking Bad, revealing him not just to be a greedy man who prioritizes money above everything else, but a man who has willfully chosen the amorality of greed and avarice – and the simple pleasures that come along with it – over the painful complexity of being human. When Jimmy shuts himself in that high-rise office at the end of “Bingo,” frustrated and defeated, only to kick himself back to work when he gets a phone call from a potential client, I found my eyes welling with tears. On the surface, this is just a determined man, picking himself up and dusting himself off after a stinging defeat; but in context, this is a man rallying against fate, like a figure in a Greek tragedy, unaware that all his toil and hardship will eventually be nullified by the predetermined arc of the story. Jimmy can fight all he want, but Saul Goodman is coming, and when he arrives, there will be little of this good man left. This is why Chuck’s betrayal stings so hard at the end of “Pimento,” and why the moment works so beautifully as the season’s defining masterstroke. Chuck didn’t just betray Jimmy in this one contained instance – Chuck betrayed him multiple times in the past, and more importantly, betrayed the emotions Jimmy felt for his brother by never feeling nearly as invested in this familial relationship. When Chuck proclaims “You’re not a real lawyer!”, it is not just a rejection of Jimmy’s recent efforts, but a rejection of Jimmy as a human being, a statement that, no matter how hard Jimmy tries, there is something broken inside of him, something that means he is incapable of ever being truly ‘good.’ We may know that this isn’t the case – that Jimmy does have the capacity for goodness, for self-sacrifice, for decency – but Jimmy is plagued by doubt throughout this series, bruised by choices and disappointments in his own past, and when his brother, of all people, confirms that fear that lives within his heart of hearts, it is the weight of a cruel predestination that Jimmy feels bearing down upon him. The sense that, no matter his efforts, the ‘game’ has been rigged from the start. It is a moment that is so big – and so fully earned – that Better Call Saul could get away with having an extremely quiet, mostly ‘uneventful’ finale. Where Breaking Bad typically saved its biggest moments for last – plane crashes, murders, bell-ringing-related homicides, etc. – Better Call Saul positioned its softest episode by far at the conclusion, as Jimmy reels from Chuck’s betrayal by going to Chicago, meeting up with old friend Marco, and wallowing in his suppressed con man instincts. This isn’t the man Jimmy necessarily wants to be – the look on Bob Odenkirk’s face when Jimmy checks his voicemail, and remembers his responsibilities, shows how clearly Jimmy is torn between these two worlds – but it’s a man he is good at being. As a con man, he doesn’t have to worry about moral standards, or impressing his brother, or putting those he loves above himself. He can lose himself in the moment, operate on pure instinct, and be happy, on some level, doing it. It may not be the sustained, truly fulfilling happiness he seeks back in Albuquerque, but the sad irony is, it hurts a whole lot less. And this is why I love the final scene of Better Call Saul so very, very much. Thanks both to some intervention by Kim and to his own efforts over the course of the season, Jimmy has a job opportunity from a good legal firm, one that might very well give him the life he’s been seeking this whole time. But when the moment finally comes, and he is inches away from taking that last, big step towards his dream, Jimmy finds he isn’t strong enough to do it. He fingers the ring he inherited from Marco, and thinks about the time he spent in Cicero, and about all the pain and humiliation he felt over the course of this season – and he cannot bring himself to go down that path again. The wounds are too raw, and the pain is too intimidating. Looking at those words on their own, it’s easy to assume this is the point at which Jimmy has broken bad, and that Saul Goodman is just around the corner. But in context, and with the strained, painful, defiant way that Odenkirk reads those lines, this moment is so much more complex than that. What is it that stopped Jimmy before? It’s not just his brother, or his conscience, or any of those easily reductive explanations – it’s the entire idea of living in a world of someone else’s standards, of trying to be ‘good’ when judgment will always come from without, and where one’s efforts don’t ultimately matter a damn in constructing one’s outward image. Jimmy tried very, very hard to be good. The world told him, in all sorts of ways, that there was no place for a good, productive Jimmy McGill – and so he decides that this is never stopping him again, and drives off, feeling liberated by the weight he just threw from his shoulders. Jimmy hasn’t quite sold his soul yet. That’s still a long ways away. But whatever he just shed was the first step, and, knowingly or not, Jimmy has solidified the unfortunate inevitability of his life’s tragic path. This moment is what I mean when I talk about ‘the human scale.’ Who hasn’t felt like Jimmy in that scene, bruised and battered and emotionally beaten from trying to be one’s best self, only to find that the outside world seems to have no place for you? Who hasn’t felt frustrated with life to the point of wanting to make a clean break with all of it, and putting oneself above the external standards one cares about? I don’t think Jimmy is doing the ‘right’ thing in that final scene, but I absolutely cannot bring myself to judge him for it. Because under the same circumstances, I doubt I would have the strength to do anything different. Having a heart is great. But being happy – even if it is a simpler, lesser, baser form of happiness – may be preferable to the seemingly unending suffering that comes with having a soul. Breaking Bad did many wonderful, spectacular things, but I would argue it never uncovered an insight about the human condition as painful and nuanced as this. All shows, even great ones, at one point or another reveal various flaws. For Breaking Bad, while the core of the show was almost invariably strong – Walt, Jesse, an antagonist, and the complicated dynamics between them all – the periphery was often messier. It’s something that has become clearer to me upon re-watching the show, but Breaking Bad started with a relatively deep bench of characters it only sometimes knew how to fully exploit. I don’t think the series fully understood Skyler, for instance, until the third season; Hank grew in and receded in importance, and sometimes felt like he was on his own isolated show; they never really figured out a great way to include Marie; and Walter Jr. never became quite as crucial or compelling a player as certain standout sequences hinted at. I think it’s easy to forget some of the awkwardness with these and other characters (Jesse, a veritable co-lead for the first four seasons, weirdly dropped off the map for large swaths of the final two years), especially since the final season mostly integrated everyone in spectacular fashion (once Hank and Marie were brought in on the secret, everything clicked). But both while the series aired and in revisiting it, I often find myself disengaged for chunks of various Breaking Bad episodes, distracted by material around the periphery that can often feel like little more than filler. 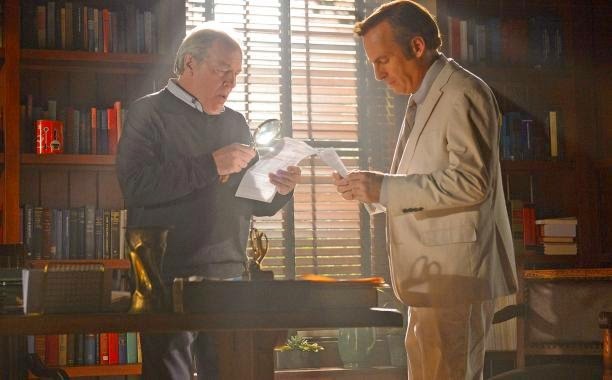 In making Better Call Saul, however, Gilligan and Gould have broken with their previous narrative habits – and, in truth, with general narrative trends of most hour-long TV dramas. Better Call Saul episodes do not, in general, have A, B, and C stories. Most episodes are centered squarely upon Jimmy, and other characters come in or out as he interacts with them. The focus is so laser-tight, in fact, that the show was perfectly willing to leave Mike in the parking booth for weeks on end, and even left contracted series regular Michael Mando (Nacho) on the bench for 6 out of the season’s 10 episodes. It’s not until one sees a show with this kind of iron focus that one realizes what so many other television series are lacking. Better Call Saul is constructed entirely around the needs of the story, and if anything turns out to be unnecessary, in any given episode, it is simply scrapped, even if that means spending less time with characters both the writers and the audience would like to see more of. That’s the pitfall many dramas, even great ones, inevitably fall into. When you have an actor and actress as compelling as Dean Norris and Betsy Brandt, it’s easy to craft stories solely to keep them in the rotation – even if, upon looking at the arc of Breaking Bad again, there were periods in which Hank and Marie probably should have taken a backseat to whatever Walt and Jesse were up to. There is a certain boldness to how Better Call Saul is constructed, then, and it is a huge part of why I enjoy the series so much. There is little to no fat on its bones, very little that ever feels anything less than essential, and I can name very few shows that have ever felt this tight and satisfying in their basic construction. Even when the season did focus on another character – almost always Mike, our other returning Breaking Bad veteran – the emotional and thematic parallels were so clear that it actually benefited Jimmy’s story to put Bob Odenkirk on the sidelines, as in the case of “Five-0.” That episode gave us tremendous insight into the man who would be Mike, unconquerable fixer from Breaking Bad, but more importantly for the purposes of this series, it crafts a very poignant message about the cost of human sin, the nature of guilt, and once again, the weight of having a conscience. 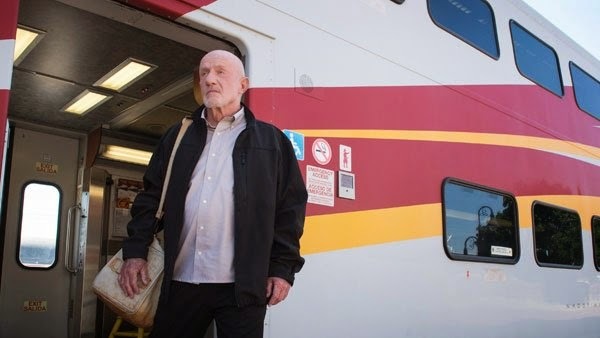 Mike isn’t the kind of guy who would ever completely sell his soul away – even at his darkest on Breaking Bad, he still has a code, and that bruised conscience that drives him in Better Call Saul is still, I think, his driving force until the bitter end. But Jimmy McGill is the kind of guy who very well could be defeated by all of this, and watching Mike struggle with similar issues helps us understand what Jimmy is going through. Because if a guy as strong as Mike can be driven by the weight of guilt and sin towards tearfully proclaiming “I broke my boy!”, then what hope does Jimmy McGill stand against the weight of the moral issues he grapples with? In short, I never walked away from an episode of Better Call Saul this season doubting the structural integrity of it; in fact, this series is such an amazingly focused piece of storytelling that every narrative beat seemed to have extra emotional resonance by the sheer amount of focus granted to it. Whether or not Gilligan and Gould can keep this kind of high-wire act up for another season, let alone several, is unclear; but after what we’ve seen so far, I certainly would not doubt them. Finally, it’s worth noting just what a beautiful series Better Call Saul is – and how it comes by that beauty largely through depictions of drab, mundane environments. Breaking Bad is one of the 2 or 3 most visually daring and inventive shows in the history of the medium, and outpaces most films in terms of raw visual impact. On that level, it is an unquestionable masterpiece, and one of the most amazing things about Better Call Saul is how Gilligan and company refused to ease off on those qualities for the spin-off. And even without the benefit of handsome desert vistas and striking exotic locales, Better Call Saul is visually breathtaking; it just has to be subtler about it, focusing on striking compositions, creative camera-placements, and extreme attention to detail to make Jimmy McGill’s world just as aesthetically intriguing as Walter White’s. So while it’s easy to say that the desert sequence in episode 2 – directed by the great Michelle MacLaren – was the visual highlight of this first season, I might actually go with the courthouse montage from later in that same episode, or with Mike murdering the two police officers in “Five-0,” or with the absolutely stunning staging of Jimmy’s bingo-related meltdown in the finale. The team worked in extravagant outdoor set-pieces when possible – Jimmy’s adventure on the billboard in “Hero,” the hand-off in “Pimento,” Jimmy’s Kettleman-quest in the woods in “Nacho” – but they consistently wringed every ounce of aesthetic ingenuity out of less-obvious sequences as well (Mike shutting down the obnoxious hit-man in “Pimento” is a comic masterpiece due as much to Thomas Schnauz’s direction as to Jonathan Banks’ wonderful delivery). Similarly, while there are only a few better handfuls of performances than those featured on Breaking Bad, Better Call Saul rose just as high on strength of its own cast. We knew the returning players were great, of course – though I’d argue Jonathan Banks has been even better with this bigger showcase, and Bob Odenkirk has been positively transcendent in turning Saul into the heart of his own series (both deserve Emmy nominations) – but the supporting cast is incredibly rich as well. Michael McKean, Rhea Seehorn, and Patrick Fabian each defied and subverted initial impressions and expectations at multiple points over the course of the season, and although Jimmy’s world is smaller, so far, than Walter White’s was, it feels no less rich or fleshed out. And that is a fairly miraculous feat indeed. But then again, nearly everything about Better Call Saul is miraculous. I went into this series curious and cautiously optimistic – and came out loving it as passionately as I have any American TV series in recent memory. 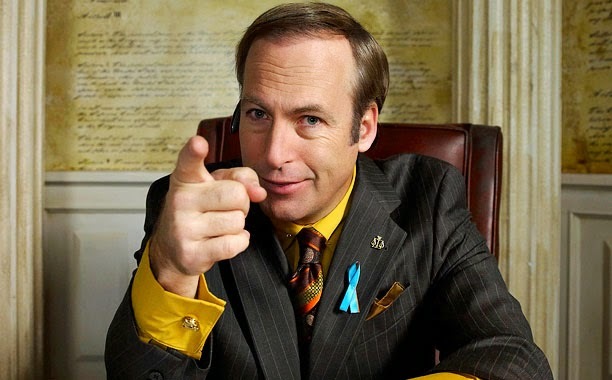 It’s only been one season, and Better Call Saul has a long way to go before we can start discussing it along the same lines as Breaking Bad, Mad Men, The Wire, The Sopranos, etc., but this is a superior first season, and one of the most confident debuts to any TV series I have ever had the pleasure of witnessing. This is one of those shows I’m simply happy to have in my life, and wherever it goes next, I greatly look forward to following it – even though I expect many, many more rounds of heartbreak before we’re finally through.